Apple brought the previously separate address bar and search fields together on the iPhone into a single convenient unified strip called the smart search field, following the path taken on most popular web browsers for PCs and Macs. When you tap the unified smart search field, the virtual keyboard appears. But you’ll also see icons for sites you frequent most often, and you can tap any of those icons to jump immediately to that site. Otherwise, the moment you tap a single letter, you see a list of web addresses that match those letters. For example, if you tap the letter s, you see web listings for Sports Illustrated, Staples, and Sears, among others. Tapping U or H instead may display listings for USA TODAY or the Houston Chronicle (shameless plugs for the media properties where Ed and Bob are columnists). Scroll to see more suggestions and the virtual keyboard slides out of view. Web pages that match your search letter. 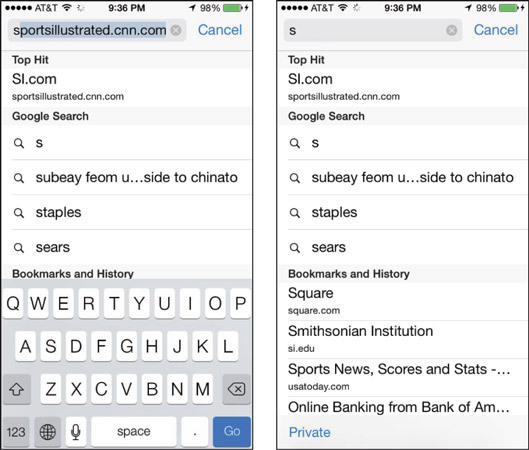 The iPhone has two ways to determine websites to suggest when you tap certain letters. One method is the websites you already bookmarked from the Safari or Internet Explorer browser on your computer. The second method iPhone uses when suggesting websites when you tap a particular letter is to suggest sites from the History list — those cyberdestinations where you recently hung your hat. This icon is another member of the Fantastic Four (along with Phone, Mail, and Music). Tap the smart search field. If you can’t see the smart search field, tap the status bar or scroll to the top of the screen. Begin typing the web address on the virtual keyboard that slides up from the bottom of the screen. The web address is also called the URL (Uniform Resource Locator, for trivia buffs). To accept one of the bookmarked (or other) sites that show up on the list, merely tap the name. Safari automatically fills in the URL in the address field and takes you where you want to go. Keep tapping the proper keyboard characters until you enter the complete web address for the site you have in mind, and then tap Go in the lower-right corner of the keyboard. It’s not necessary to type www at the beginning of a URL. To erase a URL you’ve erroneously typed, tap the smart search field and then tap the circled X to the right of the field. Even though Safari on the iPhone can render web pages the way they’re meant to be displayed on a computer, every so often you may still run into a site that serves up the light, or mobile, version of the website, sometimes known as a WAP (Wireless Application Protocol) site. The mobile version of Safari no longer supports WAP, so you need a third-party browser such as Wapzilla to access such sites. With iOS 9, Apple introduced a shortcut for getting to the desktop version of a web page, which affects only sites with separate mobile versions. This feature won’t affect the majority of websites built in the last two years. Tap the share icon at the bottom of the Safari browser, and then tap Request Desktop Site. Tap the left-pointing arrow at the bottom of the screen to return to the prior mobile view. The smart search field and other menu options disappear when you start scrolling to read a page. In portrait mode, the URL at the top is still visible but it shrinks. In landscape mode, you don’t even see the URL because the site you’re visiting claims the entire page. Either way, you get to see more of the content before you.